The most notable thing in the December issue of San Francisco magazine is a spread on "the new restaurant lounges," which asks the question "who needs dining rooms?" 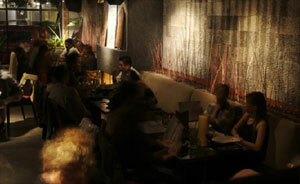 The short article focuses on Poleng Lounge in Western Addition. Loungey Poleng is designed to evoke a Southeast Asian beach hut, and at 10 o'clock becomes a dance club, complete with $20 cover charge. The article also claims Spanish Fly and the lounges at Coi and Myth as other examples of the trend. I would add just about every new high-end restaurant of the past year, which almost always seem to include some kind of secondary space (other than a bar) where people can get away with jeans while still ordering off the main menu. I am thinking particularly of the raw bar at Ame, the lounge at Straits in the old Emporium (soon to spill out under the rotunda), the windowside tables at Perbacco and even the massive lounge at T-Rex in Berkeley. But the list goes on and on and on. My theory is that the casual vibe lubricates spending better than the stuffiness of the main dining room, and not just because the alcohol is flowing more freely. If you can tolerate the noise of these places, they tend to amplify your energy rather than muffle it up. This reminds me of a story I heard from a friend who worked at Fifth Floor. He told the story of a guy who came in one day with his kids, wearing jeans, no reservation. He was very polite and understood completely that they could only accommodate him in the lounge, due at least partly to his attire. The guy starts asking some very detailed questions about the wine list, and eventually the sommelier comes out. He ends up dropping thousands and thousands and thousands of dollars on wine alone, and leaves an extremely generous tip. Shortly thereafter Kimpton spent some serious bucks refurbishing and relaunching the Fifth Floor's lounge.